Cardiovascular health is the sum of the health of many different body functions: blood lipids, blood pressure, vascular health, heart muscle health, and electrical function, to name a few. These functions are affected by factors such as inflammation, metabolism, nutritional status, stress, sleep, and so much more. Ortho• Heart promotes cardiovascular health by targeting as many of these factors as possible. Primary Uses: Ortho• Heart is designed to promote cardiovascular health through multiple mechanisms. Garlic helps to lower blood lipids. L-Theanine promotes relaxation and quality sleep. Chlorogenic acid from green coffee bean extract supports weight management. Nitric oxide improves blood vessel function and blood flow. Vitamin C supports blood vessel health and nitric oxide activity. In addition, studies support the abilities of Hibiscus and each ingredient found in Ortho• Heart to promote healthy blood pressure. This is key since high blood pressure, also known as the silent killer, tends not to produce symptoms until it is severe. 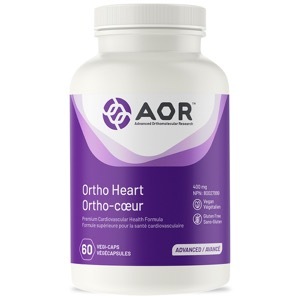 Those with a family history of blood pressure or cholesterol problems, or those looking to support their cardiovascular health and blood pressure naturally can benefit from taking Ortho• Heart. CAUTION: Do not take if pregnant or breastfeeding or with erectile dysfunction-type products. Consult a health care practitioner prior to use if you have diabetes or you are taking blood thinners or protease inhibitors. Hypersensitivity (e.g. allergy) has been known to occur, in which case discontinue use. Consult a health care practitioner for use beyond 12 weeks. Bassenge E, Fink N, Skatchkov M, and Fink B. Dietary Supplement with Vitamin C Prevents Nitrate Tolerance. J. Clin. Invest. 102(1): 67-71. Bordia A, Verma SK, Srivastava KC. Effect of garlic (Allium sativum) on blood lipids, blood sugar, fibrinogen and fibrinolytic activity in patients with coronary artery disease. Prostaglandins Leukot Essent Fatty Acids. 1998 Apr;58(4):257-63. Division of Sleep Medicine at Harvard Medical School. Sleep and Disease Risk. In Healthy Sleep. Retrieved June 8 2012 from http://healthysleep.med.harvard.edu/healthy/matters/consequences/sleep-and-disease-risk. Futoshi M, Hirofumi U, Satoshi M, Toshimi S, Kiyohiko M, Noriaki K, Noburu N, Hiroo K and Takao S. Effects of GABA Supplementation on Blood Pressure and Safety in Adults with Mild Hypertension. Japanese Pharmacology & Therapeutics. 2002; 30(11): 963-972. Guan Y, Miao C, Su DF. Effects of six antihypertensive drugs on blood pressure and hypothalamic GABA content in spontaneously hypertensive rats. Fundamental & Clinical Pharmacology. 2001; 15(4): 221-226. Gurrola-DÍaz CM, GarcÍa-LÓpez PM, S &Aacute; nchez-EnrÍquez S, Troyo-Sanrom &Aacute; n R, Andrade-Gonz &Aacute; lez I, GÓmez-Leyva JF. Effects of Hibiscus sabdariffa extract powder and preventive treatment (diet) on the lipid profiles of patients with metabolic syndrome (MeSy). Phytomedicine. 2010 Jun;17(7):500-5. Herrera-Arellano A, Flores-Romero S, Ch &Aacute; vez-Soto M and Tortoriello J. Effectiveness and tolerability of a standardized extract from Hibiscus sabdariffa in patients with mild to moderate hypertension: a controlled and randomized clinical trial1. Phytomedicine. 2004; 11(5):375-382. Ito K, Nagato Y, Aoi N, et al. Effects of L-theanine on the release of alpha-brain waves in human volunteers. Nippon Nogeikagaku Kaishi 1998;72:153-157. L-Theanine. Monograph. Retrieved June 8 2012, from http://www.altmedrev.com/publications/10/2/136.pdf. Lundberg, J., Weitzberg, E. NO generation from nitrite and its role in vascular control. Arterioscler. Thromb. Vasc. Biol. 2005;25;915-922. Lundberg, J., et al. Cardioprotective effects of vegetables: Is nitrate the answer? Nitric Oxide. 2006;15;359-362. Thom E. The effect of chlorogenic acid enriched coffee on glucose absorption in healthy volunteers and its effect on body mass when used long-term in overweight and obese people. J Int Med Res. 2007 Nov-Dec;35(6):900-8. Wan CW, Wong CN, Pin WK, Wong MH, Kwok CY, Chan RY, Yu PH, Chan SW. Chlorogenic Acid Exhibits Cholesterol Lowering and Fatty Liver Attenuating Properties by Up-regulating the Gene Expression of PPAR- α in Hypercholesterolemic Rats Induced with a High-Cholesterol Diet. Phytother Res. 2012 Jun 6. Watanabe T, Arai Y, Mitsui Y, Kusaura T, Okawa W, Kajihara Y and Saito I. The Blood Pressure-Lowering Effect and Safety of Chlorogenic Acid from Green Coffee Bean Extract in Essential Hypertension. Clinical and Experimental Hypertension. 2006; 28(5): 439-449. Webb, A., et al. Acute blood pressure lowering, vasoprotective, and antiplatelet properties of dietary nitrate via bioconversion to nitrite. Hypertension. 2008;51:784-790. Willette RN, Krieger AJ, Barcas PP and Sapru HN. Medullary gamma-aminobutyric acid (GABA) receptors and the regulation of blood pressure in the rat. Pharmacology and Experimental Therapeutics. 1983; 226(3): 893-899. William, Cara. You snooze, you lose? – Sleep patterns in Canada. Retrieved June 8 2012 from http://www.statcan.gc.ca/kits-trousses/pdf/social/edu04_0157a-eng.pdf. Wink, D., Paolocci, N. Mother was right: Eat your vegetable and do not spit! When oral nitrate helps with high blood pressure. Hypertension. 2008;51;617-619. Yokogoshi H, Kato Y, Sagesaka YM, Takihara-Matsuura T, Kakuda T, Takeuchi N. Reduction effect of theanine on blood pressure and brain 5-hydroxyindoles in spontaneously hypertensive rats. Biosci Biotechnol Biochem. 1995 Apr;59(4):615-8. Yokogoshi H, Kobayashi M. Hypotensive effect of gamma-glutamylmethylamide in spontaneously hypertensive rats. Life Sci. 1998;62(12):1065-8. Zeng T, Guo FF, Zhang CL, Song FY, Zhao XL, Xie KQ. A meta-analysis of randomized, double-blind, placebo-controlled trials for the effects of garlic on serum lipid profiles. J Sci Food Agric. 2012 Jul;92(9):1892-902.